Torah Codes 2012 by Midbar Nesher: The fallen eye from heaven prophesied by Isaiah. The fallen eye from heaven prophesied by Isaiah. Isaiah 14:14 Start with the second letter מֳ of the third word counting each two letters. Isaiah 14:12 Start with the first letter הֵ of the third word taking each letter. יב אֵיךְ נָפַלְתָּ מִשָּׁמַיִם, הֵילֵל בֶּן-שָׁחַר; נִגְדַּעְתָּ לָאָרֶץ, חוֹלֵשׁ עַל-גּוֹיִם. 12 How art thou fallen from heaven, O day-star, son of the morning! How art thou cut down to the ground, that didst cast lots over the nations! טו אַךְ אֶל-שְׁאוֹל תּוּרָד, אֶל-יַרְכְּתֵי-בוֹר. 15 Yet thou shalt be brought down to the nether-world or (hell), to the uttermost parts of the pit. 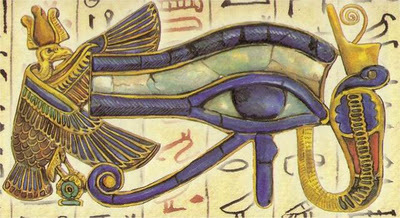 "Who invented the all seeing eye of god?" The Eye of Providence (or the all-seeing eye of God) is a symbol showing an eye often surrounded by rays of light or a glory and usually enclosed by a triangle; Today, the Eye of Providence is usually associated with Freemasonry. "Hillel son of the dawn!" Hillel is also known in Jewish mythology as the name of the chief angel who rebelled against God and was thrown out of heaven - better known as Lucifer. His full name was Hillel Ben-Shachar - "Hillel son of the dawn". The morning star (also called Lucifer) is called "Kochav Ben-Shachar" in Hebrew. The Voice of the Sign. The Chanukah and Menorah of God. The Wall of Water from the Book of Exodus. The Torah and the Code of Life.